Since the beginning of the industrial revolution, the level of global carbon dioxide has increased 40%. It is increasing at more than 5% a decade, and in spite of a lot of discussion and proposed actions, the increase is unabated. It is higher than it has been in more than eight hundred thousand years. As a result of the increase the worlds ocean temperatures has risen on average 1.1 degrees Fahrenheit and the land temperature has risen an average of 1.4 degrees Fahrenheit. Much of the increase has occurred since 1970. 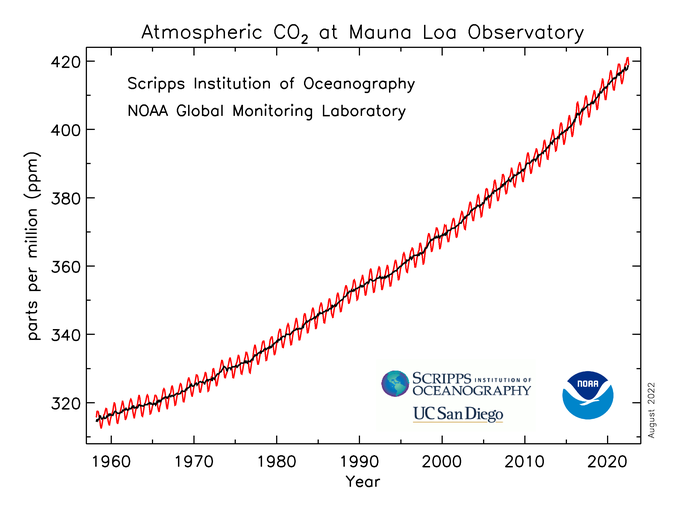 There is really little debate in the scientific communities worldwide that the cause of the increase is mostly due to the increase in carbon dioxide. Three Hurricanes in the Atlantic this year were categories 4 or 5. Hurricanes Harvey, Irma, and Maria were very destructive. All formed over waters that were warmer than average. Hurricanes and typhoons get their energy by removing heat from ocean water. With higher sea surface temperatures these storms can rapidly intensify. If the water is warmer at higher latitudes they can stay stronger. Hurricane Ophelia became a category 3 hurricane in the northeast Atlantic and did great damage to Ireland. It was the strongest hurricane ever to form in the northeast Atlantic. On land, many areas are having record heat and drought. In our area, the years 2009 , 2015, and 2017 had the highest numbers of days with temperatures over 90 degrees. The extended summer drought and heat in the Columbia River Gorge set the stage for a fire that began on September 2nd and burned an area almost 50,000 acres. The fires in Northern and Southern California burned thousands of homes and killed dozens of people. Like here, California experienced an extremely hot summer. Portugal and Spain have had terrible wildfires that have killed well over 100 people. In the rest of the European Union, the number of fires has doubled over the past few years. The fire season is starting earlier and lasts longer. There is an intense debate about climate change in the US. Our president has placed many agencies in the hands of climate change deniers with ties to oil and coal. Their claim is that the science is flawed and that there really is not a scientific consensus about climate change or even its causes. The goal of the Paris accords, from which Donald Trump has removed the United States, was to curb emissions world wide to prevent an increase of global temperatures of over 2 degrees Centigrade. The scientific community argues that if emissions are not cut, our world could see a temperature increase of 5 degrees Centigrade or more by 2100. So, who to believe? It may help to look at the evidence and how it was obtained. If it is so very important for the future of our planet, then it is worth taking time to consider it. In the next post there will be some references to help with that. Thanks for speaking out. Certainly we need to believe our own eyes. We are failing future generations with our selfishness in not addressing climate change to the best our our capabilities. The country that put a man on the moon 50 years ago can’t discipline itself enough to reverse this? We can vote for school bonds, road repairs, healthcare for everyone and other wonderful social programs until the cows come home, but if we don’t address climate change, none of it will matter. Thank you for the information and for speaking up! Looking forward to reading more.